PRINCETON, NJ -- Supporters of Barack Obama for president have views about the nation's economy that differ strongly from those of John McCain supporters, with Obama's supporters describing it in much more grave terms. According to a Sept. 15-16 USA Today/Gallup poll, most Obama voters (73%), contrasted with less than half of McCain voters (45%), believe the economy is in either a "recession" or a "depression." In sync with McCain's often-stated view that the fundamentals of the economy are strong, voters who plan to back McCain in November are more likely to think the economy is at worst slowing down. A combined 53% of McCain supporters say the economy is either slowing down or, in fact, growing. Only a quarter of Obama's voters (26%) agree. These voter differences in economic perceptions are similar to those seen between Republicans and Democrats, more broadly. Importantly, political independents (who represent the swing voting group potentially most influenced by the candidates' stances on the issue) are much more similar to Democrats than to Republicans on this question. As a result, a majority of Americans overall -- 61% -- now believe the U.S. economy is experiencing either a recession or a depression, up from 45% holding one of these views in January. Few Americans surveyed at either point have said the economy is growing, but in January the slight majority (53%) said it was either growing or slowing down. Today, only 37% hold either of those more positive views. Although the United States is technically not in a "depression," the current problems on Wall Street are being widely described as the "deepest crisis since the Depression." This could be contributing to the near-doubling since January of public perceptions that the economy is in a depression, from 12% to 23%. Slightly more Americans today also believe that the economy is in recession -- something many economists have already pronounced is underway. This is up five percentage points since January, from 33% to 38%. The expansion since January in perceptions that the economy is in a recession or depression coincides with the decline in Americans' more basic consumer confidence over the same period. Gallup Poll Daily tracking from Jan.30-Feb. 1 found 66% of Americans classified as negative in their economic views and 11% positive. Today, those figures are 78% negative and 7% positive. The consumer confidence picture is not entirely bleak, however. In contrast to Americans' grave views of current economic conditions, they are markedly upbeat about where the economy will be a year from now. Nearly half believe the economy will be growing at that point. Only 28% believe it will be in a recession or depression. This outlook is not much different from that measured in January, when Americans' underlying perceptions of current economic conditions were much more positive than they are today. Americans as a whole have grown substantially more negative in their characterization of the U.S. economy than they were at the outset of 2008. While Republicans (and McCain supporters) view the current situation in less dire terms than do Democrats (and Obama supporters), most political independents share most Democrats' view that the economy is in either a recession or a depression. From the standpoint of the election, it is clearly important, therefore, that the candidates demonstrate concern and competency on the issue. At the same time, the fact that most Americans think the situation will improve markedly by this time next year suggests they have enough confidence left in the economy to believe it can recover fairly quickly. That could have important implications for how Obama and McCain frame the current economic problems, and their proposed solutions. Results are based on telephone interviews with 1,015 national adults, aged 18 and older, conducted Sept. 15-16, 2008. For results based on the total sample of national adults, one can say with 95% confidence that the maximum margin of sampling error is ±3 percentage points. 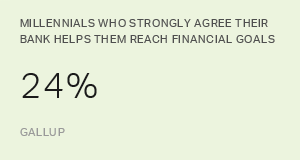 Over half of Americans (55%) say they are worse off financially now than they were a year ago, tied for the most negative reading in Gallup’s 32-year history of asking this question, but no worse than four months ago at the beginning of the summer. A USA Today/Gallup poll conducted Friday and Saturday finds more Americans disapproving than approving of how most of the major national political players have handled the Wall Street crisis. Barack Obama fares best, with 46% of Americans approving of his performance.